◆ Eliminate soluble wiring, melted marks, corrugated, silver marks on the product surface. ◆ Completely solve surface shrinkage of plastic products. ◆ Improve the surface gloss, the surface roughness is similar to mirror. ◆ Products do not need to spray paint processing, improve the rate of finished products of 20-30%. ◆ Without connecting boilers and other external thermostat auxiliary equipment, omitted the complex boiler equipment(high-pressure equipment safety and environmental approval) and Pipeline Project. ◆ Completely solve the problem of the boiler steam non-recyclable. ◆ Small volume can match different machines, 180 °C hot water can replace the boiler, which is not environmental friendly . ◆ condensate water recycling and reusing system，obvious energy saving effect . In the appliance, automotive, communication, daily necessities, medical equipment and other industries with a wide range of applications, such as LCD TV, computer LCD monitor, notebook computer, mobile phone, air conditioner, car LCD monitor, car interiors, lights and optics, OA, AV equipment and ect. 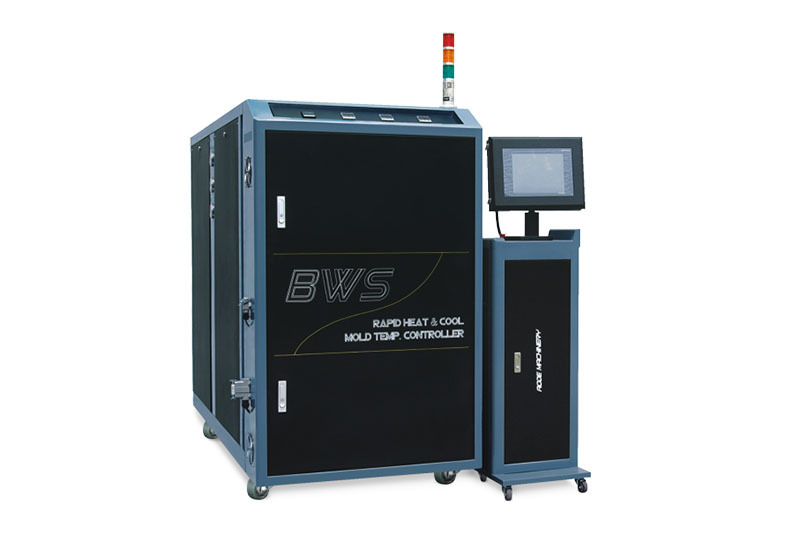 By the high temperature water, when product left the mould chamber, BWS High-gloss steam mold temperature control machine will inject hot water to the mould, when the mould temperature is up to the TG upper limit value of the plastic ,BWS begin to inject the plastic into the mould chamber, after inject mould plastic machine complete the pressure hold, cooling water will be injected, when the mould temperature low down to the lower limit and the mould open, the whole plastic injection procedure complete.